Kriminal is a comic adaptation in the same vein as Danger: Diabolik, albeit on a smaller scale. 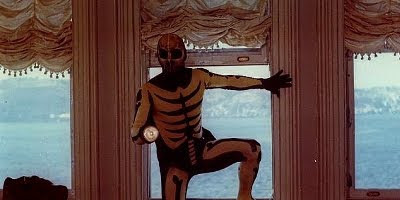 Glenn Saxson plays the titular anti-hero and master thief who wears a skeleton costume and manages to dodge the authorities with every chance that he gets following an escape from prison. The film features some well-written snappy dialogue, a decent performance by Saxson, and enough developments and action to keep the film moving along quite nicely. Kriminal does get a bit confusing in spots because of its fast pace, but it's a minor setback in an otherwise solid film. Umberto Lenzi directs, and Helga Line co-stars.